It’s difficult to consider spring when the weather seems determined to hold us in with the winter blues! But rest assured that spring is just around the corner — and if you’ve been invited to a spring 2019 wedding, it’s time to consider your outfit! It’s the not easiest season to plan for wardrobe-wise. Spring isn’t guaranteed sunshine, (not that summer is either! ), but it probably won’t need you to be wrapped up in multiple layers either. All that before you even consider the issue of trends! 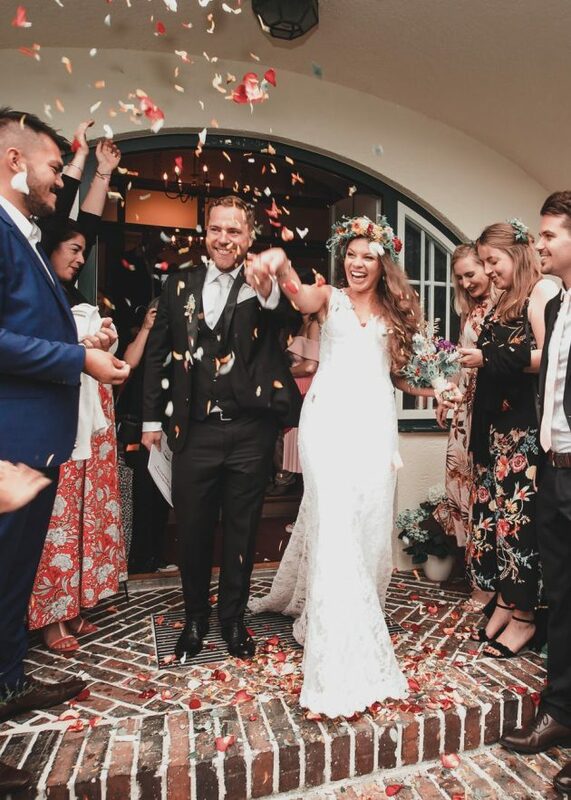 That’s why we’ve put together this handy guide so that you can navigate through all the obstacles and put together the best menswear and womenswear outfit for a spring wedding this year. The best place to start is to consider the overall fashion trends for spring this year. The seasonal trends make for a great foundation for any outfit, so it’s certainly worth doing a little research on these beforehand. For 2019’s spring season, we’re expecting to see a return to sleek minimalism with bold accents. With style icons like Meghan Markle leading the way to a more streamlined look, we’ll definitely be seeing a ‘less is more’ vibe to spring wardrobes. Alongside this is the eco-friendly trend, perfect for the classic florals of spring. Pairing environmentally-friendly fashion with the minimalist look gives a more rustic, natural feel to fashion which is definitely in-keeping with wedding trends this year too. Sticking with a love for natural and it’s worth noting that Pantone’s Colour of the Year for 2019 is ‘Living Coral’, a pink-orange coral shade that will absolutely shine with some springtime blossom vibes. For a timeless and elegant look, floral prints will never look out of place at a springtime wedding. Both large and small prints work here, so pick the one you personally prefer. For a really on-trend look, find a floral print in a coral shade — this color is sticking around all year for fashion, so it’ll keep on working through the seasons! A high quality dress from a premium brand like Rixo Clothing will not only keep you looking put-together all day long, but it will also help with sustainable shopping practices; better quality will last so much longer, which means less clothes heading to the landfill after one wear! Whatever you decide to wear, don’t be scared to prioritize comfort. You don’t have to wear a dress to a wedding — there are so many other chic and smart options out there. According to Wedding Wire, jumpsuits are paving the way to becoming the top style choice for wedding guests who want to look ‘fashion-forward’. They’re so versatile too, as they can be easily dressed up or down for further occasions after the wedding. Generally, you will want to skip the heavy embellishments here and keep the silhouette sleek and tailored. Lastly, pick out your footwear and bag. The best tactic here is to try and match your shoes to your bag; a well-known practice, but it definitely works to make your outfit look seamless. You could go for a classic court shoe, or for a nod to social media trends, square toed shoes are in the spotlight. We’ve seen a trend for slightly more casual attire for men at weddings in recent years. This is set to change back to the traditional tailored look this year, says Brides Magazine, so you need to suit up, gents! Okay, you don’t need to opt for the full-on three-piece suit, though this is a great option for layering during the unpredictable spring weather. But a trim and timeless men’s shirt is more than enough to keep you looking smart. Don’t be tempted to rock a white jacket over the top of it though, as this is reserved as an option for the groom. For those who want to channel catwalk-worthy vibes, a double-breasted jacket will hit all the right notes for spring this year. Fashion shows have seen brand titans Louis Vuitton and Burberry showing off their versions of this classic style recently. For footwear, keep it smart. You really can’t go wrong with a pair of black derby shoes. They pair well with any suit, and more importantly, they’re comfy in cold or warm weather, so you’ll be ready for whatever the British springtime conjures. Use accessories to add finishing touches to your outfit. Why not add a splash of color with a trend-hitting coral hued tie or pocket-square? Following this guide will keep your wardrobe on the straight and narrow for navigating the tricky world of wedding outfits!